Choucroute Garnie à l’Alsacienne, the perfect French winter comfort food dish. A good place to enjoy a good traditional one while in Paris is La Brasserie de l’Isle Saint Louis. I always had a particular fondness for this hearty dish based on fresh cabbage shredded in thin strips then fermented for several days in vats with coarse sea salt, juniper berries, cloves, black peppercorns, and bay leaves. This very long process (sometimes up to 3 weeks), which involves several stages of water rinsing, allows the cabbage to ferment and acquire its sour fragrance, but it can be tedious and smelly. If you want to make your own choucroute garnie from scratch it is better to buy ready-to-cook bulk already brined sauerkraut. In France the best one comes often from the area of Krautergersheim, a small town in the French Eastern province of Alsace). It is sautéed in lard or goose fat and onions, and then slowly cooked in dry white wine, preferably Alsatian, over some kind of pork meat, with juniper berries, cumin (coriander or caraway seeds), black peppercorns, clove, bay leaves, and a touch of garlic. The cooking time varies from 3 to 5 hours, depending whether you prefer a slightly crispy and acidic ‘’choucroute’ ’or a smooth softer but very fragrant one. In any case when it reaches your plate it should retain a very light off-white pleasant color. A brownish looking sauerkraut was either kept too long in the fridge or outside of its original container and most probably re-heated several times, or of a poor industrial quality. Unfortunately in a few Paris brasseries and chain restaurants this industrial approach has become too often the case. Better to stick to small family-owned Alsatian restaurants. But they slowly disappear from the market. An authentic choucroute garnie is topped with a small mountain of various samples of good artisan charcuterie, essentially pork and sausages. 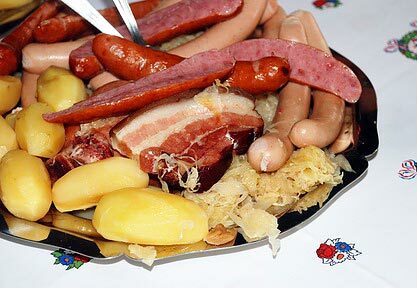 A good choucroute garnie à l’Alsacienne must have some or all of the following components: Smoked lean pork shoulder, salted pork shank, a thick slab of ‘’lard de poitrine’’ (thick slice of bacon), a couple of poached Frankfurters or yellow colored saucisses de Strasbourg. A piece of cervelas (knackwurst). A smoked boneless pork chop is often a nice addition. A small link of blood sausage. And also sometimes a small link of saucisse blanche (a variation of white boudin) or a saucisse de Montbéliard, a very flavorful small smoked sausage from the Eastern Franche-Comté region. Some restaurants add a slice of jambon de Paris (white Paris ham) and a slice of garlic pork sausage. But there are many variations on this main theme. This specialty is always served with a few freshly boiled and peeled small white potatoes. Traditionally French amateurs of Choucroute garnie à l’Alsacienne order a bottle of dry but fragrant Alsatian Riesling, or Sylvaner, or drink ‘’pots’’ (50 cl) of Alsatian beer. The origin of the choucroute itself is not proven with certainty. It is very probably the Chinese, at the time when they were building the Great Wall who got the idea of fermenting cabbage in brine. This technique was exported by the Mongols and perhaps by Marco Polo all over Eastern Europe. And it was first introduced in Western Europe in Switzerland, where it is still considered a part of the national culinary heritage, before reaching Alsace. My Swiss grand-mother, in Geneva, used to make a fantastically rich and tasty choucroute garnie. But it took her a couple of days to make it from scratch and her whole apartment building would keep the pungent smell for days. As far as I know, none of her neighbors ever complained. In fact, it is in Geneva where you can find several good brasseries serving it, and also a few great artisanal charcuteries, that I developed my first love for this dish. You find choucroute garnie in practically every brasserie all over France. But I am sad to report that for many years now, it has too often become a very inferior product, assembled from industrially produced and processed components in large food plants in various areas of the Northern part of France. If you want to eat a great authentic Alsatian choucroute, you have to get closer to its original French headquarters, the beautiful city of Strasbourg, capital of the Alsace region and, for that matter of Europe since it is the seat of the European Parliament. You will also find great choucroute and spectacular Vins blancs d’Alsace, in Colmar, a nice old charming city which is the other gastronomy center of Alsace. There you will enjoy it in noisy but beautifully decorated ‘’winstube’’ (wine rooms). Alsace is also an area where traditionally some of the best French beers have been brewed in ‘’brasseries’’ (breweries) which very often had small cafés where they served beer of course and also typical Alsatian food to their employees as well as to the local population. The tradition of choucroute garnie in brasseries in Paris goes back to the late 1800 s. When the Germans captured Alsace back from the French after the disastrous Prussian invasion of 1870, several fortunate Alsatians, who did not want to become Germans decided to flee their now occupied cherished province and moved to Paris. Many of them were cooks and restaurant owners. And when they arrived naturally worked in the field they knew the best, making beer, serving it, and cooking Alsatian specialties. Most Alsatian brasseries rapidly expanded and started to serve other dishes such as steaks, omelettes, blanquettes, escargots, chicken, etc. from morning to late night, and a lot of fresh seafood. Nowadays almost all major brasseries also offer a full service of ‘’ fruits de mer, crustacés et coquillages’’, such as oysters, mussels, and other shellfish, crab, and prawns, opened and prepared on an bed of crushed ice by a man outside in front of the of the restaurant called “L’écailler’’. He is recognizable by his high rubber boots, large fisherman yellow apron, Briton fisherman cap, and protection gloves. After the 2 world wars many other Alsatian brasseries became famous for their choucroutes garnies. Among them L’Alsace, Le Terminus Nord, Bauman, La Brasserie Alsacienne, La Brasserie de l’Est, L’Alsace à Paris, la Strasbourgeoise, L’Alsaco. Many of them either were closed in recent years or acquired by large restaurant Groups such as Groupe Flo, which now owns dozens of brasseries all over France. I understand that one of the best place to eat a good Alsatian choucroute garnie is Le Bec Rouge, Boulevard du Montparnasse in the 15th. But I never had an opportunity to eat there. Until its closing in 2007, my favorite choucroute garnie in Paris was found at ‘’L’Alsaco’’ 10 rue Condorcet in the 9th arrondissement. It was a relatively small winstub owned by the charming, very talkative, often a bit eccentric and sometimes borderline aggressive with people he did not like, Claude Steger . An authentic Alsatian, he was bringing his fresh choucroute from Krautergersheim. And all his delicious ‘’garnitures’’ whether sausages, boudins, or pork, were made by authentic artisans charcutiers either Alsatians from Paris, or directly from Alsace. He offered more than 100 great Alsatian wines from small vignerons, and an impressive collection of fruit brandies. Talking with him was like attending a class on Alsatian gastronomy. 6 weeks ago, the weather was rather grey, humid, really gloomy. On November 13, around 1:00 PM, I had a sudden craving for a good choucroute garnie to lift my spirits. But since my favorite place L’Alsaco now longer exists, I did not know where to go to find a decent one. In the past 20 years I have been disappointed so many times by the choucroute at Chez Jenny, Place de la Républqiue, or at Chez Flo, Passage des Petites Ecuries, that I did not want to get back there. Suddenly I remembered that last February I had read a piece in the excellent and always reliable ‘’Hungry For Paris’’ blog of Alexander Lobrano about this good old Alsatian brasserie located at the end of the delightful Ile Saint Louis at 55 Quai de Bourbon in the 4th. Lots of warm memories about this place immediately came back to my mind. In the very early 60s, when I was a student at La Sorbonne, I did not have much money but I was lucky to live in a comfortable room in the apartment of a friend who lived at 11 Quai aux Fleurs, in the Ile de la Cité, just behind Notre Dame. My bedroom windows were facing the mansion of the Aga Khan and the Seine river. And just a few yards from there, there was a little ‘’passerelle’’, a mini bridge of sort, that crossed the Seine into the Ile Saint Louis. At the end of this bridge was La Brasserie de l’Isle Saint Louis, which in those days did not have the charming “terrasse” it has now. At the time, it did not take me long to discover that I could have a pair of juicy frankfurters with a boiled potato and fragrant warm sauerkraut for a few francs if I ate ‘’au comptoir’’ in the mini bar area at the entrance of the restaurant. There was an Impressive old shiny metal percolateur (an ancestor of the coffee machine) at the end of the massive wood comptoir (bar counter, perhaps covered with Zinc or copper, I do not remember exactly), that is still there. By the way, if my memory is correct, the percolateur that was installed on the bar in 1913 when the restaurant was known as La Taverne du Pont Rouge, was still able to produce a strong coffee in 1959, the first time I went there when I was spending a week at the home of a couple, friends of my parents, who lived in Paris. The waiters in traditional ‘’serveurs’’ outfits including white shirts, black bow ties, black pants, black vest, and a white apron, would come to the bar to get their orders of draft beer, an excellent and foamy Mutzig from Alsace served in half-liter stoneware (grès) steins, called ‘’pots’’, and get their food orders from the kitchen through a hole in a door at the end of the bar. Sometimes the chef, a tall blond German guy name Otto, would exit the kitchen and sit a moment at the bar to drink a beer and smoke a cigarette. He would fix for me marvelous omelettes baveuses au lard (runny omelets with lardons). One of the most active and funny waiters was named Yvan, and he was always joking and making funny comments to attract the attention of the many American young ladies who visited the restaurant. He called his regular customers, including me, ‘’l’ami’’ (the friend). But he could get moody sometimes when things did not go the way he wanted. There were a couple of tables in the bar, and many times when the place was packed, which has been the case since the place opened, I would sit there and have quick lunch before going back home to study, usually a potato salad with a knackwurst, a piece of cheese and a stein of beer. Everything seemed the same when I entered the restaurant last month. The ambiance with a blend of reserved traditional older Parisian customers discussing family matters or real estate deals in a soft voice, much noisier and lively out-of-town visitors, including a few American and German tourists, and some young couples, was about the same as 50 years ago. The smells reflecting the good hearty food that is slowly cooked in the kitchen every day, was the same. The photos and posters on the walls, the collections of ancient beer mugs and steins, the hunting artifacts, the arrangement of the wooden tables with their checkered red and white cloth were still there. But a few things were different: The stuffed stork is now at the back of the restaurant, there is no longer the smoke of the cigarettes and cigar permeating everything, and I could not recognize more than one waiter. Besides, I did not know the dapper young man who was standing in front of the old wooden desk near the entrance which is the command center and the billing and cash registering station of the operation. In the early days, it was Monsieur Paul, the owner, or his wife, who were sitting there. Fortunately the waiter who was assigned to my table just behind the bar, the only one I had recognized, had been working there for more than 20 years, and he was gracious enough, besides providing good old service, to answer my questions. Unfortunately he told me than Yvan, who had been fighting in the Algerian war, and had health problems since, had passed away. Otto, who had been a cook for Marshall Rommel during the Tunisian campaign in 42-43, and had acquired the French nationality after the war, had also passed away. The elegant young man, Paul-Emmanuel was obviously managing the restaurant the day I was there. 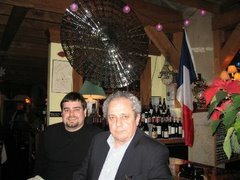 He is one of the 2 sons of Marcel and Michèle Kappe the owners of the restaurant since the father of Madame Kappe, Paul Guépratte, whom we used to call Monsieur Paul, as I just said, when I was a regular there in the early sixties retired. Paul Guépratte, the young man’s grand-father, purchased the restaurant in December of 1953, at the time it was called L’Oasis, from an another Alsatian man, Monsieur Lauer. Guépratte had an apartment nearby that he used when he was in Paris. This is how he learned about Lauer’s intention to sell his restaurant. As it was customary at the time, the deal was made with a handshake at the bar. Paul Guépratte, and his wife Marthe, who was often standing behind the front desk preparing checks and greeting customers, gave the restaurant its present name. After I finished my meal I asked Paul-Emmanuel Kappe a few questions and congratulated him on the quality of the choucroute garnie I had just finished. I told him that it was even better that I remembered it. I asked him if they still bought their meats from Schmid, a well-known Parisian supplier of Alsatian charcuterie, but his answer was that they had after many years changed suppliers. I believe the new one is Jund. He told me that they still cooked themselves their choucroute every day, and that they might be the last brasserie in Paris to do so. In fact all their hot dishes are home-prepared and cooked according to the old traditions of their brasserie. The excellent Mutzig beer, the brand thta ws already served 50 years ago, and their Munster fermier au cumin (a delicious creamy and slightly pungent Alsatian cheese served with caraway seeds), are both as good as ever. They still serve the delicious sorbets from Berthillon, an internationally famous family-owned maker of ice cream and fruits sorbets established in1954 and located a couple of blocks away. When I discovered the place in 1963, they were still I believe selling charcoal bags in the store. The choucroute garnie I ate in November was one of the best I had in years. It is served on a pretty porcelain plate engraved with the name of the brasserie. The white cabbage was cooked to perfection, aromatic with just the needed touch of acidity. It was at the same time moist and still a bit crisp. There were plenty of juniper berries and enough peppercorn left in the cabbage. Now, the best part was the incredible quality of the generous sample of pork and charcuterie. I will try to remember its components but my memory is sometimes unfaithful. One link of deliciously aromatic boudin noir (blood sausage). One link of very delicate white sausage, perhaps veal and pork based, that seemed to be flavored with small fragments of truffle. One piece of palette (lean part of the pork shoulder). One piece of pork knuckle. One frankfurter sausage. One slice of lard de poitrine (thick bacon). One piece of knackwurst. One slice of garlic sausage. And pehaps one slice of Jambon de Paris (white ham), but I am not certain about this last component. As I said, the artisan Munster cheese was very good with its cumin (caraway) seeds on the side, and so was the sorbet. I limited myself to one stein of beer. Too bad the weather was not more pleasant since I would have finished that meal sitting outside on the beautiful terrace, facing Notre-Dame cathedral, drinking a cup of their excellent espresso with a tiny glass of kirshwasser. Maybe next time since this experience was so pleasant that I cannot wait to return.